A rare and “True Gentleman” has passed away. Ken’s death is announced with great sadness. He left us, peacefully, suddenly, due to a fatal cardiac arrhythmia thereby being spared the agonies of a more prolonged life with multiple cancers. With good fortune, he had spent most of the last two years at his beloved home in Victoria doing quite well right until the end. His final moments were in his own bed, waiting for a highly anticipated lunch and with his wife, Nancy, his chief caregiver and nurse, beside him. For a lover of simplicity and all things edible, there could be no better way to go on to the next journey. May he now be in a comforting place. Ken left behind a large and loving blended family of eight children and spouses, 11 grandchildren and spouses, nine great-grandchildren (with two more on the way); sister, Joy Cowper and her large family; many dear Scottish and British relatives; and a wide circle of friends, business associates, not to mention all the family dogs, cats, birds and fish, etc. He will be sorely missed, yet leaves a legacy to them all. There were many chapters to Ken’s life story. He was born in Burnaby, BC to welcoming new parents, George and Gladys May Gregson. Ken, at age three, tragically lost his mother. His Dad fortuitously found an outstanding foster mother, Phoebe Beaven, who gave both Ken and Joy excellent examples of how to be good, responsible and hardworking citizens. They watched and listened well. Ken’s goal was set for him. He lived a happy life as a teenager in Burnaby and New Westminster. Alas, WWII intervened. 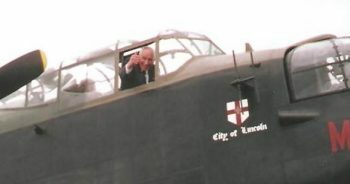 He eagerly joined the RCAF in 1943, serving as a Lancaster bomber pilot based in N. Yorkshire. During that time, he met and married his first wife, Dorothy, a gentle Scottish lass who soon immigrated to Canada. Upon Ken’s return in 1945, he attended UBC, obtaining his BCom in 1948. Raising an active family of four and all that entailed kept him very busy as did establishing several family businesses. He met, and was associated with, many fine business partners, most of whom became steadfast friends. Some of those businesses exist still. His family, Doug, Grant, Wendy and Ken, had a wise and conscientious Dad who gave them a terrific foundation upon which they have built their lives. The unfortunate death of Ken’s beloved Dorothy, in 1987, changed his life’s direction yet again. His long years of retirement became very special indeed. He married Nancy in Oct 1990, was a truly wonderful husband and outstanding stepfather to Karen, Robert, Ken and Greg. By keeping his good health, he was always involved with anything and everything, while adding to his already extensive worldwide travelling during his younger years. So for Ken and for those lucky enough to share his retirement years, it was the best time of his life, truly golden. Ken was a very special, well-loved man who lived a very active, and at times, challenging 91+ years, leaving all who knew him with indelible memories. His sense of humour, his continual chuckles, and wisdom were outstanding. He left this world with no regrets, his bucket list more than fulfilled and with the same positive outlook, optimistic attitude and happy smile that had been with him since he was a young child. As he treasured all his family and friends, so did they in return.